While many window fashions are treated with anti-static additives, your curtains, blinds and window panels will still collect dust and dirt, overtime. Allergens, like pollen, can also be a problem. If you live in the northeast, you know what we mean. Each spring, a yellow dust descends upon everything in the Saratoga Springs area, including window treatments. To cut down on household allergens and keep your luxury window treatments looking fresh, follow these cleaning tips from Saratoga’s curtain and carpet experts. Note: Detailed directions for cleaning Hunter Douglas Blinds, Shades & Window Panels, can be found in the Hunter Douglas Care & Cleaning Guide. Remove dust. Once or twice a month, gently vacuum fabric panels using a brush attachment and the lowest suction setting. If the fabric is loosely woven or delicate, hold the brush approximately 1 inch away from the curtain to minimize damage. A hairdryer on the cold setting can also be effective for blowing dust from delicate fabrics, and a simple feather duster or lint roller will work on sheers. Tip: Pay special attention to the bottom half of the window treatment and in the creases of valances, where dust typically accumulates. Spot treat stains. Mix a bit of mild dishwashing liquid in warm water and gently work only the suds into the stain with a clean, damp sponge or soft cloth. Rinse the sponge, wring it well, blot away any soap, and allow the spot to air dry. For sturdier fabrics, a clean toothbrush is also effective. If water spots are obvious after cleaning, fade them with a garment steamer. Dry clean. If your window treatments are in need of a deep clean, we recommend professional dry cleaning as you may damage the fabric. Tip: With regular vacuuming and spot cleaning, window treatments should not need to be deep cleaned more than once a year. Remove dust. Close the blinds so they lie flat along the window. Starting at the top, vacuum the blinds using a brush attachment, or dust them with a feather duster or soft cloth. Close the blinds in the opposite direction and repeat, removing dust from the other side of the blinds. Tip: To make a handy blind cleaning tool at home,wrap a soft cloth around each arm on a pair of kitchen tongs and secure with a rubber band. Wash away grime. If your faux-wood blinds are in the kitchen or bathroom, they may have collected some grease or hairspray, in addition to dust. Mix one part white vinegar and one part water, then use a sock or microfiber cloth to remove grease and grime from your blinds. 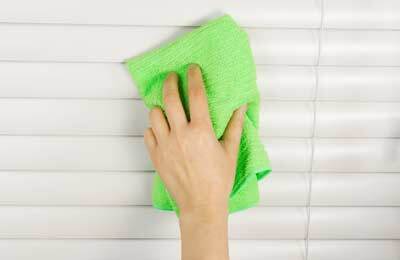 Tip: After cleaning, wipe your blinds down with a fabric softener sheet to help repel dust. It also helps remove any lingering vinegar scent. Restore wood. Wood blinds should only be cleaned with a wood surface cleaner. Apply the cleaner to a dry, clean cloth or sock, and wipe down each slat. Try to avoid touching the cords and strings, and do not allow wood blinds to get too wet, as they may warp. Sometimes your window treatments need more than a thorough cleaning – they need a makeover. If you notice sun rot, fading, warping or odors that just won’t go away, it’s time to go shopping. With decades of experience in window treatments and area rugs, our team of interior design experts at Curtain & Carpet Concepts is here to help. We are your local dealer for window blinds and shutters, custom drapes, roman window shades and ready to hang curtains in Saratoga Springs, servicing the Albany Capital Region through the Adirondacks. Need New Curtains Or Window Treatments? Get Inspired! We carry a variety of fabrics, colors, prints and textures, and offer the fastest turnaround time in the industry. Visit our Saratoga Springs Curtain & Carpet Showroom for inspiration, or contact us for a FREE consultation. How Long Will It Take For My Shades, Blinds, Shutters or Curtains to Arrive? How Do I Pick Out New Curtains? Retail Store Website Design by Mannix Marketing, Inc.